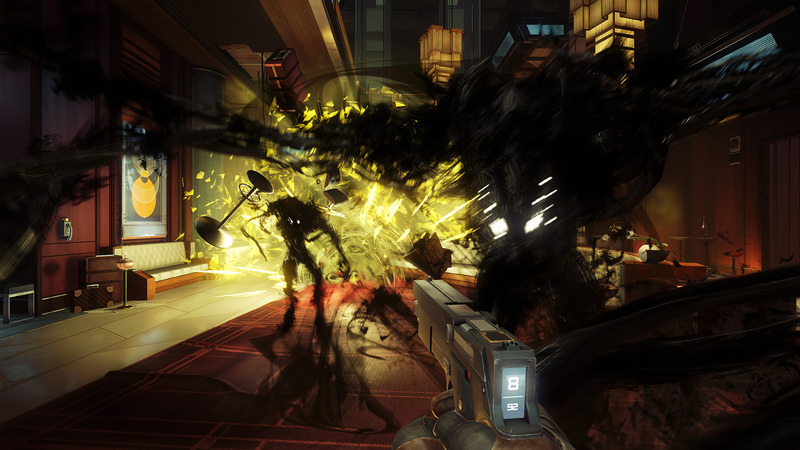 PREY or System shock (remake)? which one you are more hype for? So my friends, since both are looking fairly similar and many people compare both games. which one you are more hype for? well I cant choose between anyone. both are my most anticipated games atm. both looks and feel amazing. I guess when it comes to Shooter its Prey and when its come to immersion and RPG elements. its System shock easily. I was hoping System shock to release this year but it push back next year. to me Prey will be GOTY 2017 and System shock will be GOTY 2018.
so which one you are more hype for? System Shock is a remake of a very dated classic I never got around to play and the demo showed promise, so that. Prey has too many questionable things about it so far that has me wary of it. Terrible enemy design, seemingly having nothing to do with the prior Prey, male and female option for no apparent reason, uninteresting premise, etc. and im glad because original Prey was terrible game and prey 2 also looked bad that was cancelled. Arkane are very talented developers and can make something very special. while i agree with male/female option. its very unnecessary. but they only advertise Male morgan as of yet. I know someone who's working on System shock so he talks it up a fair bit, but if I had to choose (Cause normally I'd pick neither) I'd go for system shock. If only for the premise that it's a precursor to Bioshock, so I'd like to see how that game managed to inspire a great game. So far Prey as its had the most info released so far, although I'm curious to see how System Shock will turn out. Also Female Morgan has been featured in 2 trailers so far, and who knows maybe the story will play out slightly differently depending on what you pick. Maybe in the same vain as Fire Emblem Awakening or Persona 3 PSP, same overall experience, but with slightly different flavour. Although I doubt they would go that far. The problem I see is that instead of being something completely unique it borrowed the name of another IP and will most likely try and loosely tie them together. Benefitting neither the devs or fans of the old Prey. Well, this isn't the Dishonored devs (just devs under the same banner) and Chris Avellone is a good writer, but this doesn't seem like a game driven by the writing or the characters (something Avellone is good at). The marketing hasn't been good either and the game is right around the corner, so I'm very sceptical. They will need to prove themselves at release. That's kind of my problem. If nothing but the VA or maybe a handful of dialogues/sitations are slightly different I don't see the point of not establishing the character as either male or female (but both). That generally doesn't benefit the story and storytelling at all. my friend, if anything this game will elevate the name PREY. the game is not just follow linear path. its vast space station that you can explore, RPG elements, hacking, find a way to fix elevator before reaching another deck. If anything. its closest thing to System shock 2 this generation. and i have not played any game like this after system shock 2 which was released in 1999. and no bioshock was not SS2 spritual successor. it was mediocre poor mans dumbed down system shock. At this point in time we don't know if this game will be good, mediocre or bad. Also the fact that it uses the Prey name when it doesn't seem to have anything to do with the old Prey is not a positive. Saying that it's the closest thing to X in this gen doesn't really mean much. You seem to be hyped for this new Prey but I'm very sceptical. On the other hand I am more interested in the SS remake (which would actually be the closest thing we have to SS2 this gen), which is what this thread is about. I don't think Prey has a lot of hype for it (but I could be wrong), so hopefully they can get more people excited for the game before launch. Especially since the future of the Deus Ex and Dishonored series seems to be sketchy at the moment. I never played the original System Shock. But I'm super excited for Prey! I love Dishonored and Prey looks very similar but with a Sci-Fi twist. And FYI, it's 'hyped', not 'hype'. I'm sitting here waiting for a Dead Space sequel/remake. I want to like Prey but it looks lifeless aesthetically. I haven't seen much of System Shock, but I'm looking forward to that the most out of these two. I haven't really seen any reason to care for Prey from what I've seen of it thus far.